"We chose to set ourselves apart in the industry, as we always have, as we continue our quest for best-in-class status. SAI Global was most valuable with the timing of pulling together an upgrade audit and qualified auditor to perform the audit." Automation Tool & Die started as a custom tooling manufacturer, then expanded into metal stamping in direct response to market demands. To meet the requirements of its growing customer base, the company knew that it needed a registered Quality Management System (QMS). In 2001, the company sought QS 9000:1998/ ISO 9002:1994 certification and, a year later, it was successfully registered to the standard. As the company continued to grow, so did its quest for best-in-class status. Consequently, it set out to pursue the new ISO/TS 16949 standard to set itself apart in the tool and die industry. It became one of the first companies registered in northeast Ohio and the surrounding communities, successfully registering in 2004. When Automation Tool & Die sought to consolidate its four facilities into one in 2016, the company faced the prospect of a re-registration audit at the integrated facility then transitioning to the new replacement standard. Instead, the company opted to transition to the new IATF 16949 standard - which supplements ISO 9001:2015 and is designed to achieve global consistency in quality system requirements in the automotive supply chain - to elevate them as an elite company in both the U.S. and Canada. To facilitate the process, Automation Tool & Die teamed with SAI Global. In just five months, the company finalized the effort by moving into the new consolidated facility and completing the transition audit and certification. It was registered to the standard in July 2017, setting the stage for its future growth and success with a new QMS that provides for continual improvement through minimization of defects, variation, and waste. "Automation [Tool and Die] was faced with timing constraints, as we were finishing the building of our new state-of-the-art facility — a facility that put all of our processes under one roof, unlike the four buildings we previously worked out of." Automation Tool & Die has been producing high-quality custom tooling solutions since 1974. As its customers began to seek expert involvement at every level of the manufacturing process, the company evolved by entering the metal stamping industry in 1989. Since that time, Automation Tool & Die has introduced a range of value-added services, from plating and tapping to assembly and distribution. Today, the company operates with 75 full-time employees out of a 105,000-square-foot building on 22 acres, where it continues to expand its capabilities. Automation Tool & Die entered the metal stamping industry in 1989 as a direct response to customer demand. But with its expansion came the need for a registered Quality Management System (QMS). To the company, having a registered QMS meant the ability to better meet customer requirements and increase demand by continually improving processes and products while enhancing operational efficiency. After achieving QS900:1998/ISO 9002:1994 certification, the company strategically grew, adding a distribution center, manufacturing resource planning system, and other value-added processes. 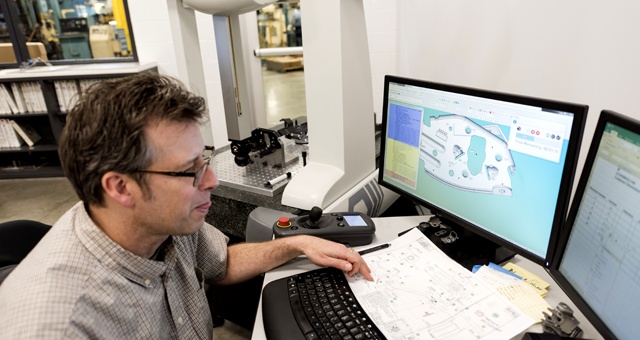 For Automation Tool & Die, a top-rated registered QMS was suddenly more important than ever, so the company aggressively pursued the new ISO/TS 16949 standard, achieving registration in 2004. Having an elevated ability to market to current and potential accounts was an accomplishment well received by customers. At that point, the business felt poised to continue its growth trajectory. A decade later, the company set out to build a new state-of-the art world headquarters that would house all four of its existing facilities and processes under one roof. But shortly after moving into the new site in 2016, Automation Tool & Die faced the prospect of a re-registration audit because of the relocation of its processes. Despite having just completed a three-year audit cycle of its registered QMS, the company opted to forgo an upgrade audit to the existing ISO/TS 16949 standard and instead aggressively pursue the global replacement IATF 16949 standard, which also requires compliance with ISO 9001:2015. But the company needed guidance to facilitate the process as quickly as possible. To that end, the company faced some difficult choices: keep the schedule of conducting surveillance audits every six months and do the upgrade audit to the existing ISO/TS 16949 standard or bite the bullet and switch to yearly audits and choose to aggressively seek out implementation of the new IATF standard. "Although our processes did not change, the moving of the equipment and process flow was quite an undertaking." To read our full customer success story and take a closer look at Automation Tool and Die's action plan, click below. Most importantly, with the implementation of lean practices, the company has elevated customer confidence and peace of mind that the company will meet its requirements and continue to deliver quality products and services that will ensure customer satisfaction. "For a company that is registered to a QMS, it makes complete sense to continually improve business practices that result in improved profitability and to strive to be best in class, world class in their industry."